TITI, elles sont superbes ces corvettes et quand je vois pour quelles missions les hollandais les construisent je me demande si ce n'est pas 2 corvettes comme celles-la et non 2 M frégates dont nous avons besoin !? Michel, voici surement le concurent dont la DCN parlait dans ton article sur leurs futures corvettes de classe Gowind !? Salut TITI, est-ce que la construction des nouvelles corvettes hollandaises a déjà commencé ? - K Korvet (90 m de longueur avec un équipage de 40 personnes). Pour ce projet, il n'y a plus de NH-90 mais l'on parle d'embarquer de petits et légers hélicoptères et des M-UAV (Maritime Unmanned Aeronautical Vehicules). Pour le restant, et voir les croquis repris avant, c'est bien ce modèle! La Marine indonésienne à commandé 4 corvettes SIGMA. Voir les photos dans Shipspotting. L'une des deux, qui sont occupées à faire les essais, était à Den Helder pendant les Vlootdagen 2007. Pour de plus amples informations, voici quelques pour en savoir plus sur les corvettes SIGMA. Alors si je comprend bien, les nouvelles corvettes feront les mêmes missions que les M-fregates revendues !!! Les nouvelles corvettes SIGMA de la KM auront comme principales missions, de patrouiller dans les Antilles néerlandaises, à la place des M-fregat, et dans la Mer du Nord. Les principales tâches seront la lutte contre le terrorisme, le trafic des personnes, la drogue et d'autres missions dans le genre. Toutes les informations sont dans le "Marinestudie 2005" qui est accessible via internet. Il semblerait, d'après les dires d'ici, que la construction commencerait à partir de 2010!! 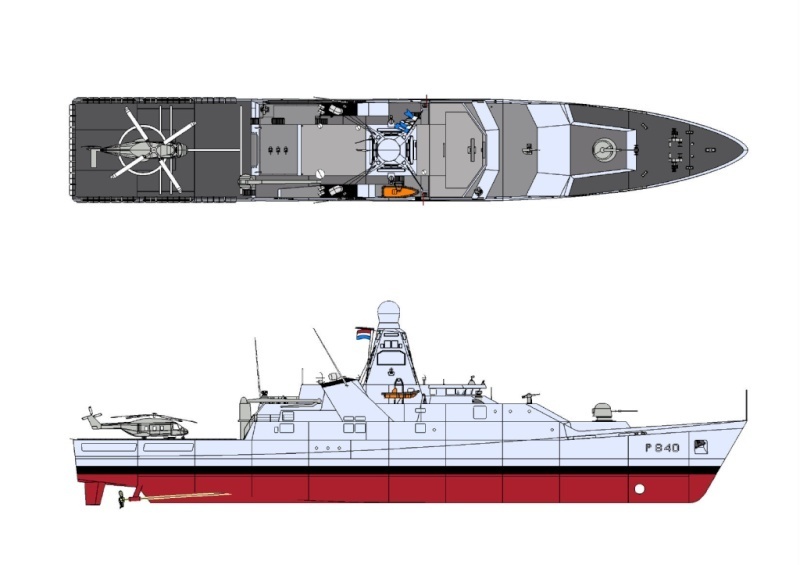 The new ocean-capable patrol vessels expected to be ordered by the Netherlands shortly will be 102.4 meters (336 ft.) long and will have a displacement of 3,750 tons, senior officials involved in the program disclosed today at the IQPC-organized OPV Conference in Rotterdam. 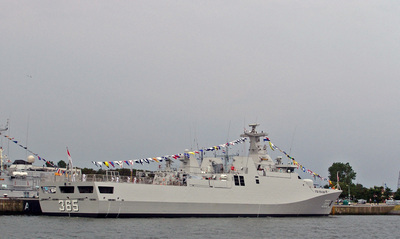 The four ships are to be procured at a projected cost of 448 million euros ($627 million at the current exchange rate). However, actual cost is turning out to be "several million" above that amount because of developments outside the control of the program, such as the rising cost of raw materials such as steel and the increased cost of labor, a senior program official tells Ares. 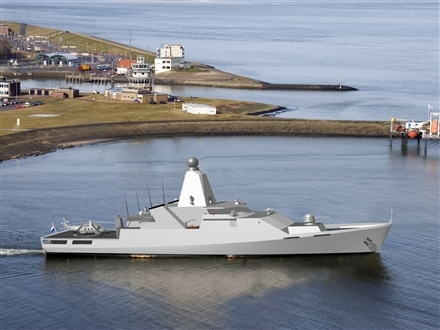 As Ares reported on 9/12/2007 ("DSEi - Dutch OPV order could be signed in November") the two contracts involved (one for shipyard Schelde Naval Shipbuilding; the other for combat systems supplier Thales) may become official November 8 -- but officials warn that this depends on the political approval process which involves Parliament. "It may be that the November 8 date is a little bit optimistic," Ares heard today. 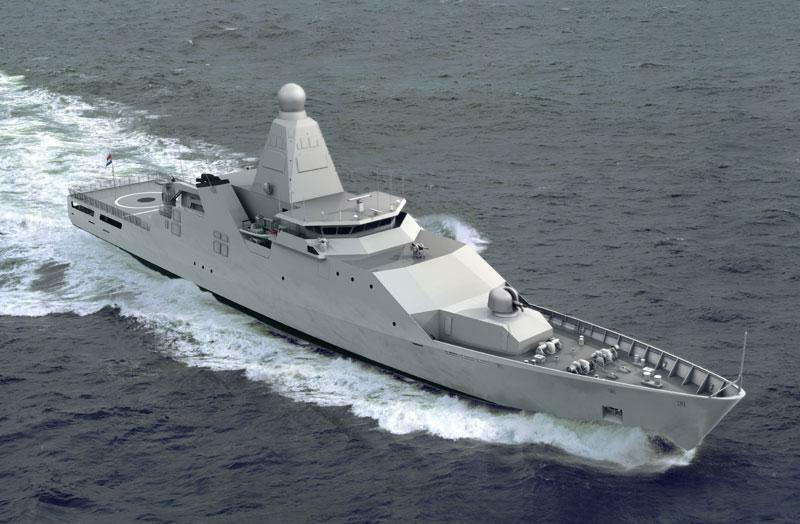 Previously undisclosed performance figures for the new class of OPVs were presented at the conference by the senior naval architect, Prof. J.J. Hopman who recently joined Delft University of Technology after a long-standing career with the defense ministry's naval shipbuilding division. The ships themselves will not be particularly fast: 22 kts powered by a diesel-electric hybrid propulsion plant that provides 2 x 5.4 MW of power for high speed on diesel and 2 x 0.4 MW for slow speed and loitering on electric drive. They will, however, be equipped with two high-speed (40+ kts) seaworthy 40-ft. interceptor craft that can be launched and recovered in Sea State 5 (see separate post for some more details). An NFH90 naval helicopter will also be part of the standard equipment, and this can also be launched in Sea State 5 (rough) sea conditions (provided the ship has selected am optimized heading and speed). The crew of the heavily automated ships will number 50, while they can accommodate another 40 personnel for special missions. In addition, 100 evacuees can be taken on board and supported for up to three days, Prof Hopman says. The armament will be dimensioned to deal with asymmetric threats posed by terrorists or organized criminals such as drugs traffickers, he says. However, he adds, "these are naval ships, but not warships" [in the sense that they could take on high-intensity warfare roles]. Weapons will include an Oto Melara 76-mm. medium-caliber gun, one lightweight (20-30-mm.) gun, two .50-cal machine guns and two non-lethal weapons (fire-fighting monitors). 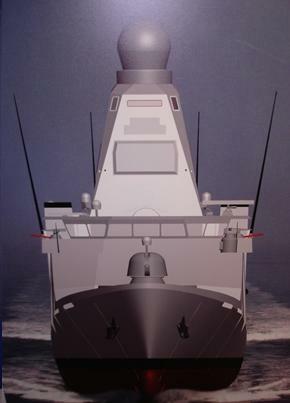 The sensor suite will be as described in our previous post (see also the video that accompanied that) -- the integrated mast module housing the various new-generation sensors will have an overall weight of 52 tons and will be built up from standard shipbuilding steel by the navy's own shipyard at Den Helder. When ready with all Thales-supplied sensors and communications systems installed and integrated, the complete mast module is to hosited and bolted on board the new ships. The sensors and comms will be dimensioned to allow the ship to build up and maintain "excellent situational awareness" over a wide (140-naut.mi. radius) area and to be a node in command, control, communications, computers and intelligence (C4I) networks, Prof. Hopman says. 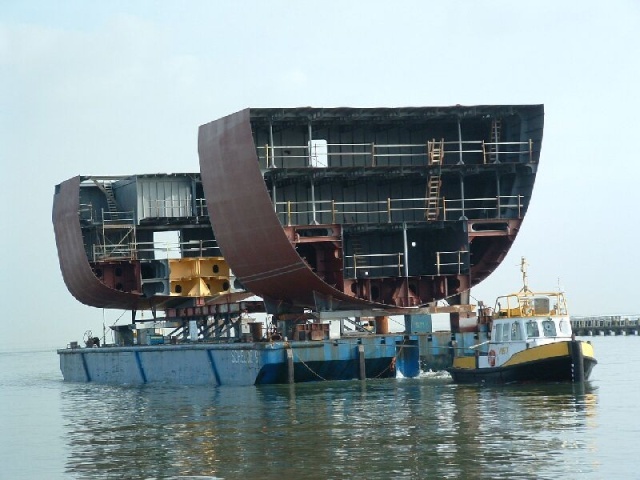 Because building will be done in parallel (two each at Schelde and at its sister shipbuilding company in Romania), the four new ships can be delivered over a comparatively short period of time: between late-2010 and late-2012. 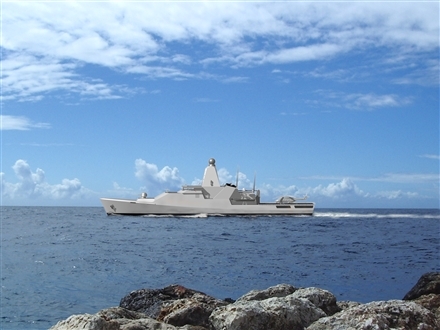 The lead ship is to be delivered, shaken down and its crew fully-worked up for the unit to deploy the Netherlands Antilles in the Caribbean by mid-2011, to arrive in time for the hurricane season to be on stand by for relief operations in the region when required, Commander Jeroen de Jonge (RNLN) of the Defense Staff Requirement Division says. 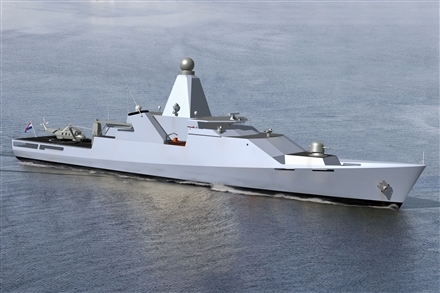 The ships will be built according to commercial standards, but because of the possibility that pirates, drugs smugglers or terrorists may be encountered, the navy has decided to give them improved survivability features: some ballistic protection, a gas citadel, and blast resistant bulkheads to reduce the damage in case of an on-board explosion, says Prof. Hopman. For night operations, the ships will be capable of using "deceptive lighting," says the professor. "The OPVs will be permanently equipped with a lot of extra lights to simulate being another type of ship, like a fishing vessel for example," he tells today's IQPC conference. In case things go badly wrong (either on board or in a crisis ashore), the OPVs will have "extended medical facilities". Other features include the ability to load two 20-ft. containers (a 10-ton crane is standard fit). 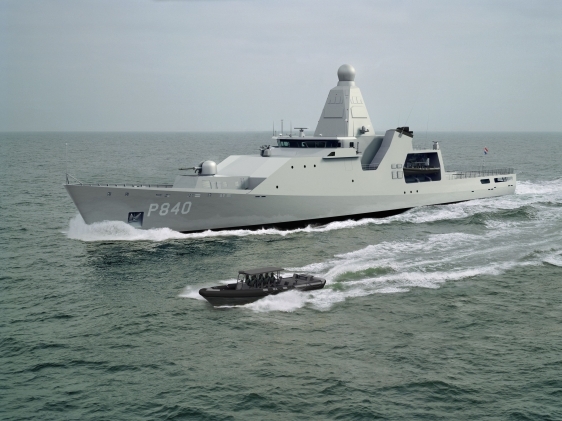 For a more in-depth description of the Netherlands OPV program and new developments in OPV programs elsewhere, see the November issue of Defense Technology International (DTI) which will feature an article devoted to the topic. - the Gatekeeper infrared/electro-optical 360-deg. panoramic surveillance and alerting system. Thales Nederland, Schelde Marinebouw en het ministerie van Defensie ondertekenen donderdag 20 december contracten voor de bouw van vier patrouilleschepen voor de Koninklijke Marine. De patrouilleschepen worden ingezet in kustgebieden bij militaire operaties op en vanuit zee. 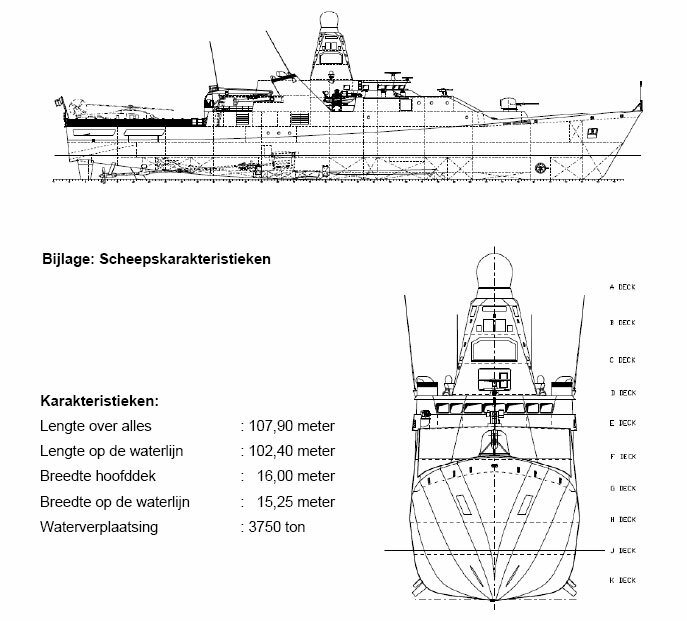 Het eerste patrouilleschip zal volgens planning eind 2010 worden opgeleverd. Het project is goed voor de Nederlandse werkgelegenheid; met de bouw zijn 1500 manjaren werk gemoeid. Namens het ministerie van Defensie ondertekent directeur Lex Hendrichs van de Defensie Materieel Organisatie de contracten. Voor Thales Nederland is directeur Adri Blokhuis aanwezig en algemeen directeur Hein van Ameijden tekent namens Schelde Marinebouw. Het gaat om drie verschillende overeenkomsten voor de ontwikkeling en de bouw van het scheepsplatform, de mastconstructie en bijbehorende sensor- en communicatieapparatuur. De patrouilleschepen worden 108 meter lang en zestien meter breed. Elk schip biedt accommodatie voor vijftig bemanningsleden en veertig opstappers, zoals een helikopter detachement, een medisch team of hulpverleningstroepen. Daarnaast biedt het schip capaciteit voor honderd evacués. Ter ondersteuning zijn twee grote rubber boten (RHIB’s) en één NH90 helikopter aan boord. De schepen worden voorzien van de revolutionaire SMILE zoekradar en de SEASTAR oppervlakteradar. Bemensing: 50 man/vrouw, maximaal 90 man/vrouw. - 2 grote RHIBS voor onderscheppingen. Février 2009 - Début de la construction du Hr.Ms. Holland avec le transport des tronçons du futur navire par voie navigable sur une barge jusqu'au lieux d'assemblage dans les chantiers naval de Damen Schelde Naval Shipbuilding à Vlissingen.